You can tell an auditory learner almost immediately particularly in a group situation. Your visual learners will be looking at you and seemingly paying attention, while their minds are wandering. But your auditory learner might be visually zoning out, looking at nothing in particular and might have their head turned with one ear toward you. That’s your auditory learner right there… he’s listening to every single word you say, while at the same time looking at his feet or scratching the back of his neck. I encounter this a lot in class, particularly with kids who haven’t been taught to “look at someone when they’re talking to you” (which by the way is counter-intuitive for an auditory learner who might generally prefer to turn to hear you). Auditory learners also like to hear themselves speak… they can’t keep quiet for long, but they like to listen to learn and follow verbal directions well. A quick test for an auditory learner is to watch their eye movements when asked a question about a place or time they remember. You’ll recall visual people will generally look up to their left for remembering images, and up to their right when constructing them. Auditory learners tend to look either horizontally to their left (remembering sound) or to their right (constructing sound). Ever had a someone play guitar just for you? They kind of give you this creepy zoned out look where you’re not sure where they’re focusing their gaze, but it’s really them listening and thinking as they play. Auditory people also use words like “I hear what you’re saying”, “Let me explain it again for you” and “Listen to that!”. So this is all great and fascinating stuff, but how the heck do you teach those guys when you’ve shown them 5 times already Mr. Visual karate instructor?? A little exercise I do sometimes in class is to teach a technique visually and verbally, and then have students pair up and take turns teaching it to each other. You’ll notice your visual learners will just show the technique and your auditory learners will break it down, step by step with explanation. So that brings us to the conclusion of our brief discussion on auditory learners. Who’s up next?? But today I want to take a break from that stuff and share with you a quick sparring exercise that I did last night with my students. 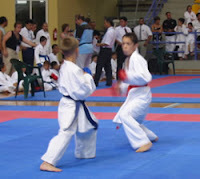 In traditional karate kumite, the first to score earns the point, and this exercise below helps develop timing, reaction and commitment to attacking technique. Students gear up and grab a partner for sparring. Students begin sparring with each other as per usual and both may attack, defend and do whatever they usually do when sparring. Several times during the round, your job as their instructor/coach is to shout “kiai!”, at which time students must immediately slide in and make reverse punch (gyaku zuki) regardless of what they might be doing at that time. They might be half way through an attacking combo, not doing anything, or might be defending an attack already in motion. 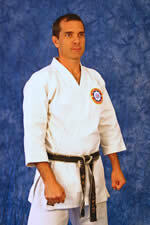 The objective is for each student is to score the gyaku zuki before their training partner does the same. This is a great karate drill because it forces students to modify their attacking combo; counter attack at a time they might not have been thinking about it; and if doing nothing at the time of your command it makes them change their timing and forces them to attack. Remember in tournament point fighting, timing is critical. There might only be a split second between you hitting your opponent and your opponent hitting you, but that is the difference between scoring a point and being scored upon. The sharpest, fastest, and competitor with the best timing earns the point. This exercise helps your students become that person. And the great thing is that you can do this exercise with students of any age, kids through adult. Try it in class and let me know how it works for you (post your comments please). Ok, so last week we talked a little bit about how what we see as instructors might be completely different to what our students see. And we came to the conclusion that until we can communicate effectively to everyone in our class, there are going to be students who, “just don’t get it!” when really it’s our responsibility as martial arts teachers to make sure they do “get it”. Often students are labelled as talented, smart, intelligent, dumb, stupid, slow, A.D.D, etc. which much of the time may not be true. What might be more accurate is those students labelled as “intelligent” might be the ones aligned with our individual way of teaching… on the same wavelength so to speak. And those who are sometimes labelled “A.D.D” may certainly be very intelligent, but process information differently to you or me – simply be tuned to a different wavelength. KEY POINT: Just because we’re listening to different radio stations doesn’t make a student more or less intelligent. So how do you teach so everyone learns? If you have the opportunity to work individually with a student there are certain ways to determine if they are VISUAL, AUDITORY or KINESTHETIC in their approach to learning. Today I’ll give you a brief overview of visual learners since this group makes up 65% of the population. It’s possible to figure out which group a person predominantly fits into based on a few simple tests. One test is to watch the EYE movements of your student when asked a question. For example, 90% of people who tend to visualize things will look up towards their left when questioned about a past event. The same people will look up towards the right when visualizing something that is yet to happen, or when they are accessing the part of the brain involved in imagination. Visual people also tend to use descriptive words like “I see”, “watch this”, and “look at that!”. Visual people also speak very quickly as their mouths attempt to keep up with the images they see in their minds. Visual learners learn well by watching, looking at a diagram or drawing a picture. In essence, they must “see it” to learn it. Since the majority of your class will be predominantly visual in their approach to learning, it’s the most important standpoint to be able to teach from (in terms of reaching the most people). In other words, just show them! Demonstrate the technique and have them repeat it. Make corrections by SHOWING them again, and have them repeat it again. Remember they don’t learn by listening, they learn by watching. Also be sure to draw diagrams using different colors to get your point across, or ask your visual learners to close their eyes and imagine how to do the technique before performing it. You can also give them specific things to work on visually. For example… if your visual student is failing to bend their front knee, have them stop, close their eyes and imagine what their stance should look like. Then have them show you. These are just some methods I use when teaching visual learners. There are more. But for now these ideas should get you pointed in the right direction.